How can I do all of this? That's the number one question I get when I coach. The quick answer is you can't do all of this. There are so many effective activities from which to choose. Just think about these choices: guided reading, literature circles, inquiry circles, reading conferences, reading workshop, silent sustained reading, Socratic Seminars, reciprocal teaching, readers' theater, and literacy centers. All are good options and many combinations of these choices will result in students who learn to become proficient readers. Even though some of these activities overlap, teachers can only do one at a time. While students can be reading silently and others can be working in literacy centers, the teacher can only be in one place. One way of mapping the year is available on this site. I came to my plan because of my experience building a new house. Let me explain. I had to decorate each of the rooms from scratch. I went to the store with list in hand but when I got there, I drove myself crazy with all the possibilities! I wanted to get what I needed for the kitchen, but then I would see a great fixture for the dining room. I was flitting from one thing to the next and not really doing anything well. In desperation one Saturday, I made a wish list for each room of the house. I promised myself to focus on one room when I shopped. That way, I spent the whole day getting something accomplished. Over a period of 5 years, I got everything I wanted completed and in place. The same is true for teaching, I realized. Give yourself permission to put the foundation pieces in place slowly. Let the students get in a groove as well. I'm not saying that we can't be flexible and add a piece here and there as needed. But when starting out, make a wish list of hoped-for accomplishments. Then lay them out on a timeline so that you make progress over the course of the year(s). I offer my timeline as an example of what's possible. I created a timeline after many years of teaching the proficient reader strategies. This plan works for students with little background knowledge of such strategies. My wish list takes my parameters into account. 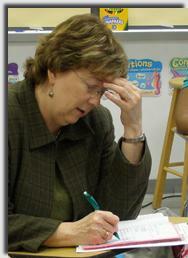 It's designed for a reading workshop format: introduction, work time, closure, and student and teacher reflection. Use 4-6 weeks to teach one strategy. As you and your students become more adept at using the strategies, you will see that no matter which strategy you study in depth, you study them all. In other words, you can't visualize unless you connect. You summarize and connect to infer. Even so, I focus my minilessons around one proficient reader strategy per unit. That way, we can build that strong foundation and add to it all year. ? Plan to flex groups month by month to be sure to give students a chance to interact with different readers and different levels of text. As you can see on my matrix, I begin by reading a whole-group book, move to interest groups, ability groups, challenging-text groups, and independent reading. I switch up who works with whom often to address all learning styles. Teach all the genres required by your state. I matched my required genres to the strategy we study. For example, I find visualization works well with fantasy and connections work well with historical fiction so I like to teach those at the same time. Teach new ways to respond to reading is part of my on-going implementation of daybooks. I introduce partner journals during retelling and summary months. I model double-entry journals during connection and question months. Those work well together. Teach new ways to learn vocabulary. I challenged myself to make sure I introduce a variety of vocabulary activities throughout the year. I tie learning the proficient reader strategies to learning vocabulary. For example, during our study of Monitoring Comprehension Strategies I teach my children how to spot and dot multi-syllable words. During connections, we study metaphors and analogies. Take advantage of the links you see in your curriculum. Introduce an assessment strategy each month. In August, I listen to each child read within the first 10 days of school. As we move into connections month, I introduce Star Charts so that I can map initial discussion. From the Star Charts I am able to assess which readers feel comfortable contributing to discussions. I add more and more Quick Formative Assessments each month. Eventually, students choose from many alternatives to demonstrate what they learn. Study hyper-standard English used on tests. In my state, my students are tested on using connections in reading. What better month to study North-Carolina- style connections and test-question stems than Connection Month? And why not look at how our state words "think and search" or "author and me" questions than during inferring month? I am just beginning to add writing objectives to my timeline. Why not teach similes during connections month, I wondered. How about descriptive language and dialogue during a unit on visualization? Foreshadowing with inferring? As you look through the matrix, you will see a smattering of writing objectives I feel pair well with the reading unit I’m teaching. Integrating social studies, science, and math studies is my next step. Read Comprehending Math by Arthur Hyde and you will see what I'm thinking and demonstrating now. Soon, Cris Tovani (Stenhouse Publishers) will publish a book showing how we use the same comprehension strategies in any content area. However, the skill lessons are different when studying different contents and texts. I’ve created a timeline for skills that match the comprehension strategies in different content areas as well. My timeline might work for you and you are free to use it. However, it will more likely serve as a model. Lay out your goals for your grade level, taking into account Common Core, your state or school standards, your students, and your teaching style. Talk with others at your school. Start by identifying the strategies you want to study in depth this year. And remember, breathe deeply and say to yourself, I can't do all of this today! (Just like decorating my house.) That's why you're making a tentative plan! 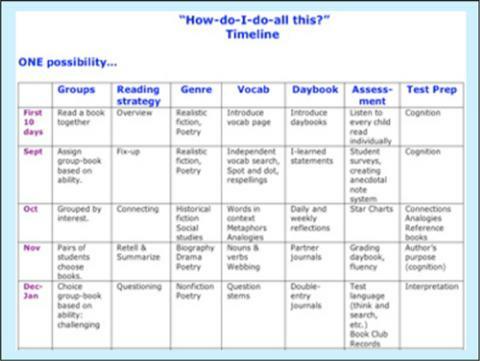 Get the full school-year time line plus a chart showing how to get more accomplished in your literacy block.